I do wish climate science deniers would make up their minds on things. Anthony Watts keeps getting himself in a muddle and doesn't know if he's coming or going. Earlier he was telling big fat lies about the scientific consensus on climate change, falsely claiming it was less than 97%. Including “global” before “climate change”, Cook et al. dropped 33 of the 50 most cited papers. I don't know if Tol is correct or not. But if he is, it should be obvious to everyone that the 50 most cited papers would confirm that humans are causing global warming, if they took a position on the matter. Adding them could only strengthen the numbers. As an aside, the Tol argument is about sample size and distribution not about the validity of the consensus. There is no suggestion that the result would have been any different had the Cook study examined a larger number of papers. The Cook study examined more than ten times the number in the Oreskes study. 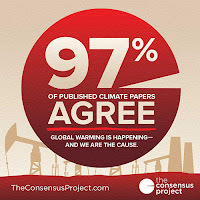 At least they are now both conceding the 97% plus scientific consensus that humans are causing global warming. Richard Toll's position is a very strange position for someone to take. That is - someone who believes that climate change is happening and that humans are responsible but that he doesn't think we should do anything about it. I suppose this is also Lomborg's view. But to have this view they have to conclude that humans of the future do not matter and that we have no ethical obligations to future generations. I think that we do and that the rights of people today are just the same as the rights of people 100 or 200 years from now. Yes, I don't know what game Richard Toll is playing. He may have decided he's not getting the recognition he wants by the mainstream so he's trying for glory with the denier crowd. Or he might have some personal animosity towards the researchers. Does he know them personally? If so, why doesn't he sort it out in private first? If not, then what is the cause of his petulance? A mystery. Richard doesn't seem to be disputing the 97% as such. Or at least I've not read him disputing these actual findings or those of similar studies that had the same results. What he seems to be saying is they should have looked at an even larger sample of abstracts. I've no idea why - he isn't clear about that. 12,000 papers on the general subject, with almost 4,000 expressing a position is a sample more than large enough for valid conclusions. It's way more than any other peer reviewed study. Thanks Martin, I've just fixed them all, I think. Rebuttal to Greenfyre - "Poptart gets burned again, 900 times"
I did notice your claim that E&E has an editorial board. Of course they do. They don't always/often? subject the articles they publish to peer review. E&E prides itself on being contrarian. Fortunately you handily provide a link to a website on which it shows that some of the authors on your list have been telling you for years that you've wrongly listed their work. So thanks. I'll update my article accordingly.